SpongeBob: (laughs) I hope I do as good as that guy. Doogie Williams: (backstage) Man, those people will laugh at anything. Hey, don’t sweat it kid, I got them all worked up for you. Sandy: Go get ‘em, SpongeBob! Fish #1: Oh brother, this guy stinks! Fish #2: Hey, hey funny guy, I've got a joke for you! What smells rotten and puts people to sleep? SpongeBob: And they smell! But hey, you’d stink too if you spent three months buried in dirt. (crowd laughs) Hey, why does it take more than one squirrel to change a light bulb? Patrick: That’s a good one, huh, Sandy? Mr Krabs: That was fantastic boy. You really knocked them out! I think I’ll do this joke night thing again with you as the headliner! SpongeBob: I never thought I could be a headliner! Whatever that is. SpongeBob: Mops, mops, mops, what’s up with those things? I mean, really. (walks up to Sandy) Oh hey, Sandy! SpongeBob: Did you enjoy the show? Sandy: Well, ac-actually SpongeBob, no. Those jokes are hurtful and you know it. SpongeBob: Come on Sandy, I was just joking. I mean, everybody knows that you’re the smartest one in Bikini Bottom. Sandy: Well, I can’t argue with that. Scooter: Hey look guys! (it’s three kids, the one speaking is Scooter, the surfing dude) It’s the stupid squirrel! Fish #4: I know, let’s try to communicate with it. Sandy: Hmph! (throws the deodorant into the cart tjem walks up to a little kid) Hello, little critter! What’s your name? SpongeBob: La-la-la-la-la-la. Squirrely, squirrely, squirrely, squirrel. Because they're stupid. Because they're stupid. Sandy: Umm, I need to talk to you about them squirrel jokes. Sandy: Y-y-you see? That’s what I’m talking about! SpongeBob: Ah, that’s just Patrick. He’s just fooling around. Sandy: I’m just asking you as a friend, please lay off them squirrel jokes, ok? Tell some of them other jokes you got. SpongeBob: (nervously) Other jokes? (imagines the fork joke) Bah! I got a million of them. SpongeBob: Uhh, hi. (chuckles nervously) Uhh, did you hear about the goldfish who went bankrupt? Now he’s a bronze fish. (crowd is confused) I guess you heard that one. Sandy: I haven’t heard it! Good one, SpongeBob! SpongeBob: Thank you, you’re too kind. Hey, what about this water! I mean, the stuff’s everywhere. Patrick: Tell the one about the squirrel and the light bulbs. SpongeBob: Uhh, hey, what about this thing! (takes out a big rubber chicken) Huh? Huh? SpongeBob: (thinking) What do I do? Who do I do? SpongeBob, you’ve got a choice to make: (looks at Sandy) your friends (looks at his microphone) or your career. (drops the microphone and everyone gasps. He walks backstage then jumps back on stage with hillbilly teeth) Howdy, y’all! (crowd cheers loudly) How come it takes more than one squirrel to screw in a light bulb? All: Because they’re so darn stupid! SpongeBob: (laughs as he walks around tooting a bicycle horn) My people! (Sandy gets angry) But seriously folks, I want to give a special thanks to my friend, Sandy. (spotlight on Sandy as the two women around her giggle) Sandy, don’t you see? The crowd loves these jokes. Am I right? (crowd cheers) Don’t you see, Sandy? We’re laughing with you, not at you! Do you understand now, Sandy? Huh, do you? Sandy: I understand everything that’s going on, SpongeBob. Sandy: (reading the letter) You were right SpongeBob! Those jokes are funny! Come on over to the treedome tomorrow and celebrate, Sandy. SpongeBob: Sandy, are you feeling alright? SpongeBob: Uhh, Sandy, I think something’s wrong with this seat. Sandy: Oh wait, don’t tell me. I know this one! Sandy: Well, why didn’t you just say so! (puts the end of a hose in SpongeBob's mouth) Yup, us squirrels sure is stupid. (connects the other end of the hose to a pipe then turns it on. SpongeBob enlarges as more water enters into him) Dumb, dumb, dumb, squirrels is dumb. SpongeBob: Ok Sandy, I get it! SpongeBob: Ok Sandy, Ok! I get it! 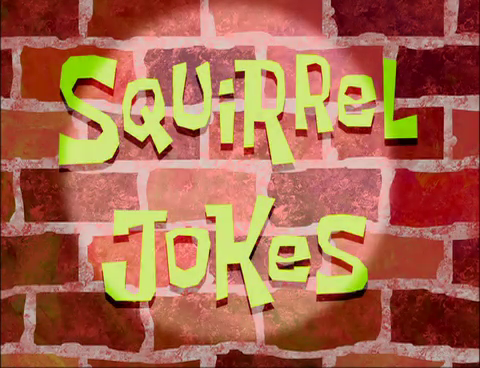 (SpongeBob is filled up every inch of the treedome) No more squirrel jokes. (scene cuts to the Komedy Krab where the crowd is chanting for SpongeBob again) Thank you, thank you very much. Well, on my way over here, I ran into a squirrel. (winks at Sandy) And I said, “Hey, why don’t you go get a couple of squirrel friends and we’ll go change a light bulb.” (crowd laughs) But seriously folks, the only thing dumber than a squirrel is a sponge! (crowd is silent) I mean, we’re so dumb, we don’t even have a vertebrae! (twists himself) Look at me! I got no bones! SpongeBob: Crabs? Oh brother. They’re so cheap, they can’t even pay attention! Mr Krabs: (laughs) It’s true, I am cheap! SpongeBob: Now let me tell you about those fish? Boy are they smelly. Whoo-hoo! I mean how can a creature that spends so much time in the water smell so bad? I mean, really! (imitates a fish) Soap, soap, what is soap? (crowd laughs more. SpongeBob and Sandy give each other a thumbs-up as the scene cuts to an outside view of the Krusty Krab) And don’t even get me started on starfish.